Our children live in a world of GPS navigation and instant access to maps on computers and cell phones. Traditional mapping skills may not be part of their daily lives as it was when we were in school. Don't let them lose the understanding of geography that past generations held simply because the technology is available! Instead, look to find ways to introduce maps and atlases to our children. By using our own genealogical research, we can show our children that reading a map isn't a lost skill. In fact, it can be both interesting and fun! Family history research provides ample opportunities to focus on mapping skills simply by way of necessity. Vital records are created and kept according to the locality. Census records are divided by enumeration district. Residential location could give us a clue as to where our ancestors enlisted in the military. Genealogy gives children opportunities to learn mapping skills in a practical, hands-on method. They see an immediate need for the skill rather than learning it in an abstract manner without real-life application. Geography doesn't have to be dull, either. As a child, I remember looking over aerial photographs of the family farm that hung in my great-aunt's living room. These photos helped me put stories about past generations into a specific place in the area. Understanding the location of the farmland allowed me to connect my family to the lives of others in the area. It also gave me a real-life application for maps at that age. It showed my family's location in space. If you are lucky enough to have a collection of aerial photographs like these in your local historical society, archive, or even in your home, your children can have the experience of matching area maps with the photographs of their ancestors' hometown. When introducing maps to your child, be sure to reach out to them on their level. Although approaching a young child with a large and detailed historical map may be intriguing if you have an adventurer on your hands, it could also be intimidating to a child who isn't yet ready to process that type of information. Generally speaking, younger children in early elementary grades focus on basic mapping skills such as using the compass rose, understanding direction, becoming familiar with reading maps on a neighborhood level. Simple skills such as locating relatives on a city street map based on city directories can be a fun activity that gets kids accustomed to reading these maps. Creating their own maps can help them understand these concepts. As children reach mid to upper elementary, additional maps are introduced. Concepts such as resource maps, local geography and topography, and the scale are highlighted. This is a great stage to begin looking at maps included in local histories. Encourage kids to identify the areas on current maps available today. Older children will begin to focus on mapping skills that require more advanced analysis and interpretation. Encourage them to look at changing boundaries throughout your area's history to determine how this may have affected those living within the county or state borders. Or, put your census research to work to create an analysis of a neighborhood highlighting the power of maps to show trends in education, employment, or military service. When we talk about maps, what do you picture? The creased AAA map or Rand McNally atlas that your father kept in the door pocket of the car? If this doesn't excite you - or your kids - add a little variety! Topographic and resource maps can help children discover the lives of their ancestors by answering questions about the terrain and natural resources or crops present in their homelands. Railroad and military maps show the how geography shaped everything from travel and transportation to the victory and defeat of battle. Land maps and plat books allow us to identify the neighbors and potential connections of our ancestors as well as many of the physical boundaries such as rivers that may have defined their daily routines. This is a great project for even the smallest cartographers. Younger children can simply map the area in a general manner indicating the home and landmarks or landforms such as lakes or rivers where your ancestors may have fished or travelled. Maps of urban areas can be drawn indicating businesses, places of employment and churches or other houses of worship that could have played a part in your ancestors' lives. City directories, Sanborn Fire Insurance maps, and even historic newspapers can be utilized to find interesting information that can be integrated into your child's map. As you learn about your ancestors' lives, look into record sets such as non-population schedules to determine the types of crops that they grew or how their land was developed. Similar to a traditional resource map, this map can give us insight into how our ancestors, and their neighbors, lived and worked rather than highlighting a region as a whole. Or, use the same concept to highlight which family members were in the military or were affected by a specific outbreak of illness. 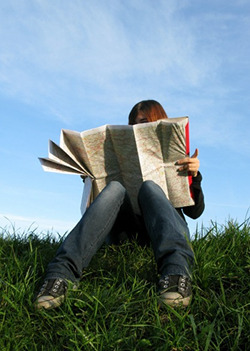 Geography-based activities such as geocaching and waymarking can be beneficial. Participants use handheld GPS devices or apps on smartphones to locate caches. Although you have your GPS in hand, you are teaching your children valuable skills in relation to deciphering a location based on longitude and latitude. In this case, technology is our friend. Many regions have caches that highlight local history and geography. For instance, the Ohio Historical Society maintains several geocaches to highlight the history of the state. If none exist in your area, try creating your own to share the information you've found in your research. Historical markers are a wonderful way to learn more about the people and events that built the area. Again, by using your maps and GPS devices your children can use their knowledge of local geography to locate these signs and then learn about the people, places, and events presented. Explore websites such as Remarkable Ohio to learn about markers near your family's home or area of research. Other fun activities that involve maps and geography include History Pin and What Was There. Both websites provide users with the ability to place their family history in a specific location. This encourages kids to connect geography with not only their family history but their present lives as well. Bonus Tip: Wondering how you can integrate these sites into your lessons? History Pin provides activity and project suggestions for use with children. No matter what type of activity you choose to use when engaging your children in mapping skills, adding your family history shows them that maps are not only useful for where we are going but also from where we came - with or without technology. You are also giving them hands-on and practical uses for their newly developed skills. Grab your map and explore some geography with your kids today!